An old Irish folktale tells of a greedy farmer named Jack, who was approached one day by the Devil. He tricks the Devil into climbing a tree, then traps him there by carving a cross into the bark. Jack allows the Devil to leave only after a promise to never take his soul. Years pass and Jack eventually dies, however he was far too greedy to gain entry into heaven. Jack approaches Hell but is denied entry as well. When he asks how he will see in the gloom between worlds, Satan mockingly throws him a coal from the fires of Hell that will burn for eternity. 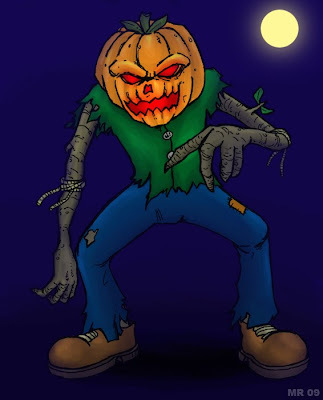 Jack hollows out a pumpkin to place the coal inside, then wanders the Earth, forever searching for a resting place. 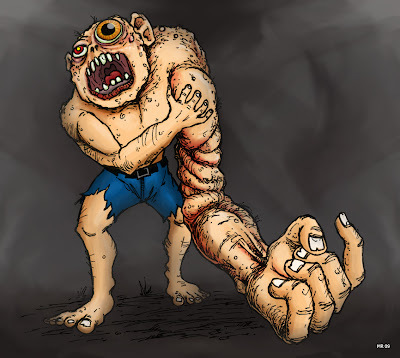 The Cyclops originated from Greek Mythology. According to the poet Hesiod they are giants with a single eye in the middle of their foreheads, and are strong, stubborn, and "abrupt of emotion." They are originally defeated by the old Titans and placed in prison, but are later released by the Gods. In return the Cyclopes forge the weapons of the Gods - Zeus' thunderbolts, Poseidon's trident, Artemis' bow, etc. After Cronus is overthrown they become assistants to the smith god Hephaestus. 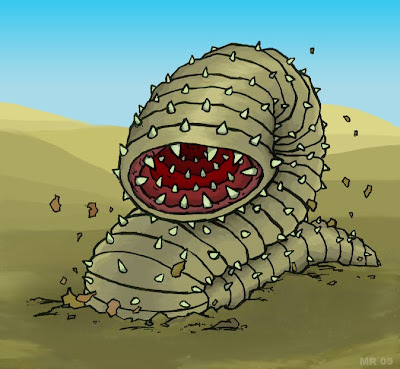 The Mongolian Death Worm is a large (2-5 ft) creature which has been reported in the Gobi Desert. 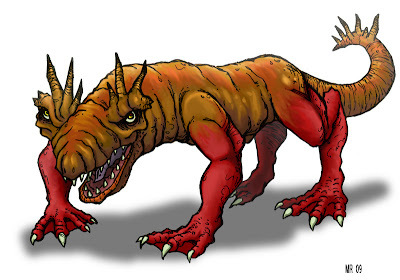 The creature is supposed to be colored from red to tan, and resemble the intestine of a cow. 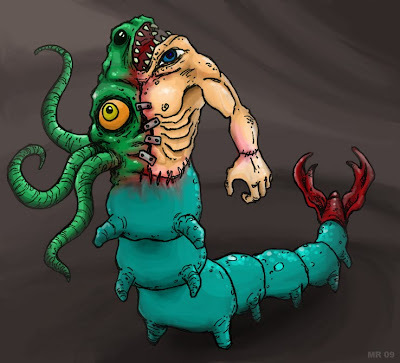 Strange abilities have been attributed to the worm, such as the ability to spew sulfuric acid or generate electrical discharges. Another rendition of a Cactus man, wearing clothing. 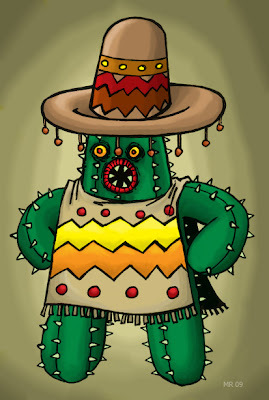 Although they are highly xenophobic, the Cactus men have adopted certain traits from humanity. In addition to the occasional Cactus man seen wearing clothing, they also have also been seen playing guitars, using fire arms, and have a working postal system. 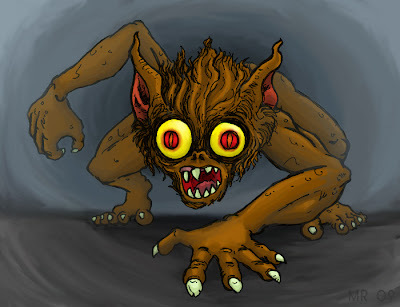 A Revenant is a ghost or animated corpse in medieval belief, often returned to terrorize the living. Those who lead greedy, self-serving lives were likely to return as the walking dead. Revenants were also known to return to enact revenge (for example, against the one who murdered them,) or to give warnings. 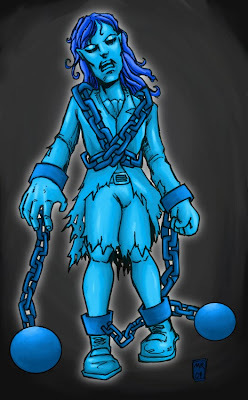 In "A Christmas Carol," Ebenezer Scrooge's deceased business partner Jacob Marley returns as a Revenant. 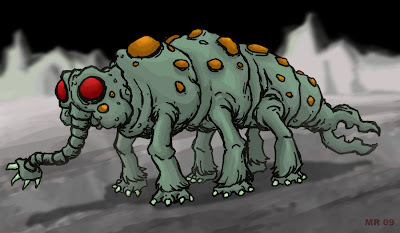 Large, insect-like mammals that scour the Moon's surface for space plankton. Moon Shamblers move in herds across the vast dry plains, migrating around the Moon once per month in order to stay within direct sunlight. These 20 foot animals are able to survive in the vacuum of space by using a form of photosynthesis to obtain oxygen from direct sunlight through the small bulbous organs located on their skin. MeMeMeeps are among the most dangerous life forms in the galaxy. 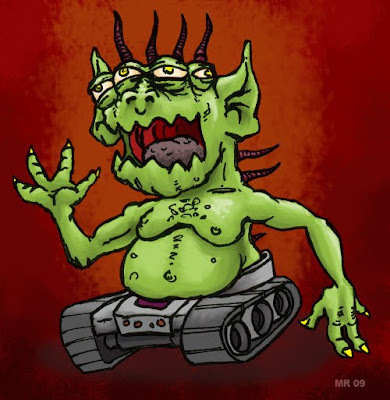 What appear to be small, cute little squeeky things have been a plague on civilized worlds for eons. MeMeMeeps are tiny little eating machines, and each make a distinctive "meep" sound. They are of limited intelligence but in large groups seem to share a hive mind. MeMeMeeps have the ability to hypnotize most sentient life forms, forcing it to do their bidding (which usually revolves around feeding.) Once a MeMeMeep matures it will graft itself into it's host's body, usually directly into it's brain. Millions of spores then infect the host, which eventually busts into millions of MeMeMeep larva. After centuries of effort most of known space has been cleansed of the MeMeMeep threat, although some less than educated populations keep them as pets. 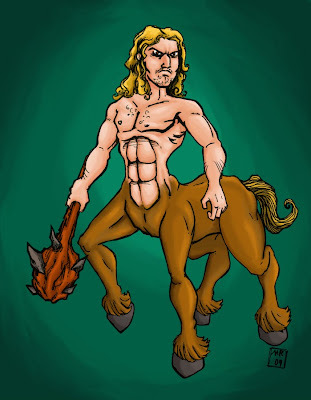 Centaurs are a hybrid monster of half-man, half- horse from Greek mythology. They are depicted with a wild, untamed, "horse-like" nature, with excessive sexual appetites. However there are also moral and wise Centaurs as well, such as Chiron the teacher. The most prevalent theory on the origin of Centaurs is that it is a misinterpretation of a riding culture by a those who are unfamiliar with horses. A man mounted on a horse would appear as one animal at a distance. 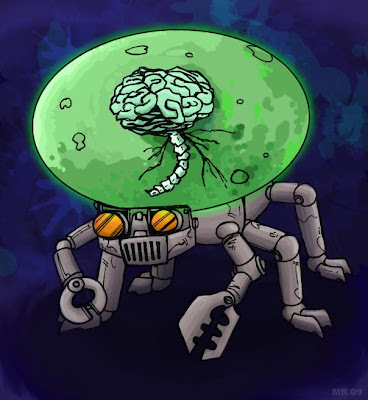 The disembodied brain of a great scientist, kept alive by his own hideous genius and lust for power. 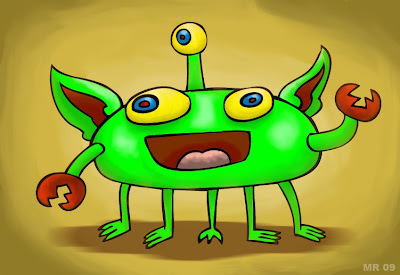 Phollywogs are bizarre mutations, originally created as designer pets for the ToyWerks toy company. They are grown from eggs, engineered to overly respond to stimuli, and have short life spans. 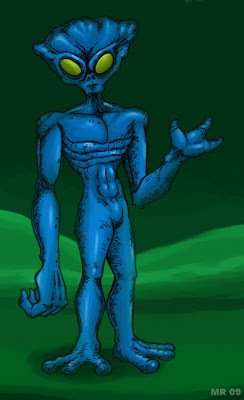 However several inherent flaws in their genetic code allowed some of the Phollywogs to break their genetic programing and escape. 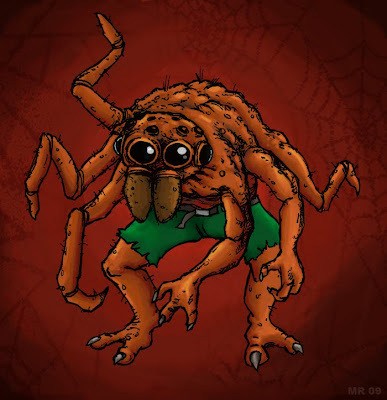 Due to their short maturation cycle it was only a matter of time before thousands upon thousands of Phollywogs nearly overran the civilized world. Many years later, the Phollywog threat has finally been contained. However there are still sporadic reports from isolated areas, and the Department of Phollywod eradication is ever vigilant. 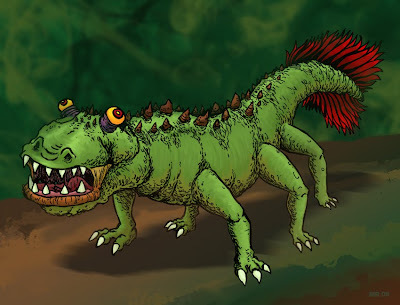 The Archadon is a giant, prehistoric, six-legged amphibian. Long thought to be just an urban legend, an expedition by a devoted group of cryptid hunters have finally turned up a relic population of the beast in a secluded Florida swamp. 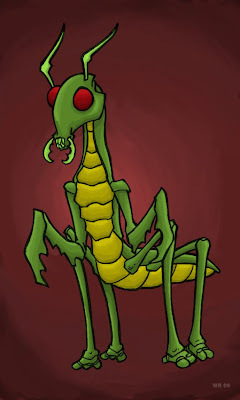 As the creature shows many features found no where else in the fossil record (six legs for example,) many scientists believe it shows evidence for extraterrestrial tampering in Earth's evolution. Large, fire breathing dragons, perhaps the most savage of their breed. 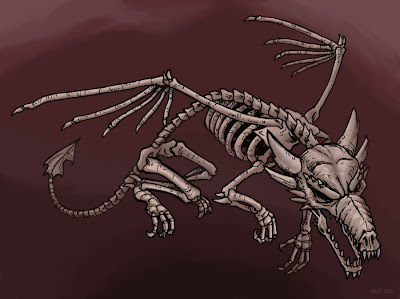 Red dragons come in a variety of shapes and sizes, including winged and ground dwelling versions. 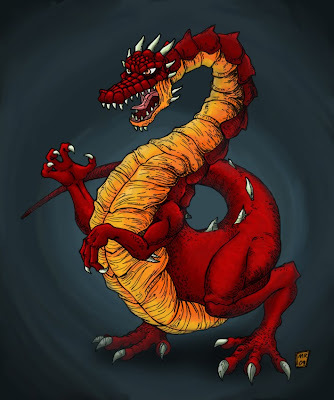 They all however share certain characteristics in common - high intelligence, ability to breathe fire, hording of treasure. Elders of the species also develop highly advanced magical abilities, including transformation and illusion casting. 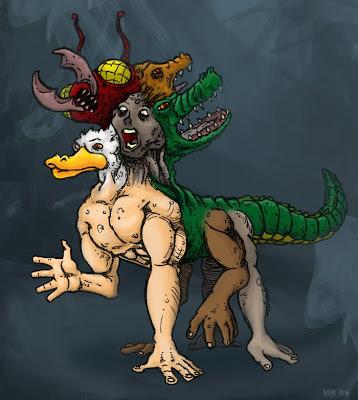 An Ant-Duck-Alligator-Dog-Human hybrid, grown from a cell culture infused with the mix of DNA. The Hoop Snake is a "Fearsome Critter," one of the fantastic animals mentioned in stories from the American west. 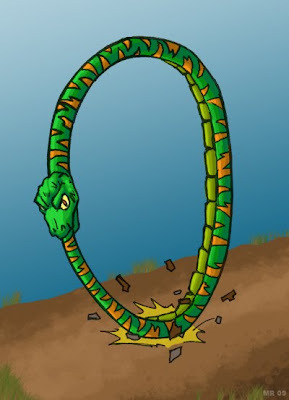 The snake coils itself into a hoop shape and rolls down hills to gain momentum when hunting. At the moment of impact it straightens out like a spear and impales it's prey with a poison stinger in it's tail. Tales of the Hoop Snake probably evolved from sightings of Sidewiders and other snakes with similar locomotion. 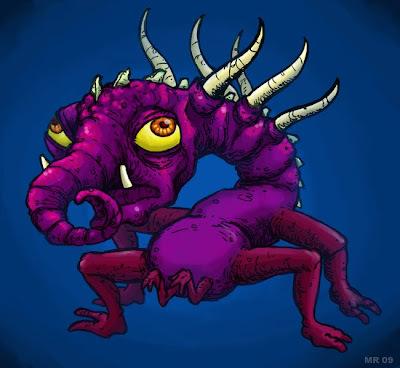 The Urodeliac is a large, voracious, amphibian resembling a salamander. They are known to grow in excess of 20 feet long. 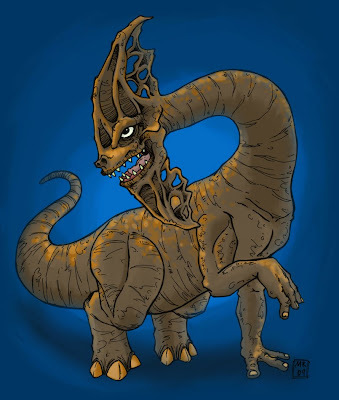 The horn-like protrusions around it's head are motion sensing organs, which detect subtle changes in air and water currents in order to compensate for the creature's poor eyesight. A century ago the all known populations of Urodeliac were hunted to extinction, but sightings still randomly occur around the globe. 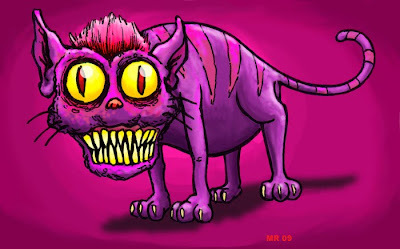 The Cheshire Cat is a character in the classic Alice in Wonderland, written by Lewis Carroll. The cat appears frequently and engages Alice in bizarre conversation. He has the ability to disappear a piece at a time, and when the Red Queen orders him beheaded, escapes by making his body disappear. The character is probably based on a specific type of cheese that was molded into a cat, which was made in Cheshire, England. A large, semi-mobile carnivorous plant native to South America. The Termina Muscipula begins life as a spore which attaches to an adult tree. 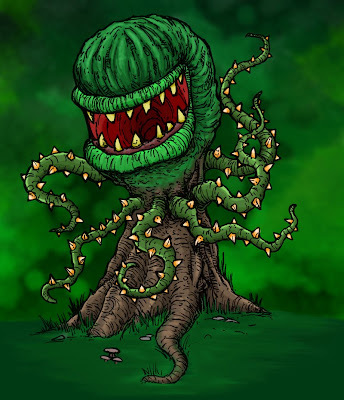 Over the next few years the spore grows quickly, consumes and displaces the top portion of the tree and uses it's bottom root system for it's own nutrient gathering purposes. It then develops a complicated system of thorny vines which catch small rodents, birds, and other animals to supplement this process. These vines also give the plant a degree of locomotion. The Termina Muscipula has been observed fleeing the area of a forest fire. An aberration of science, named after the mythical beast of Greek legend. 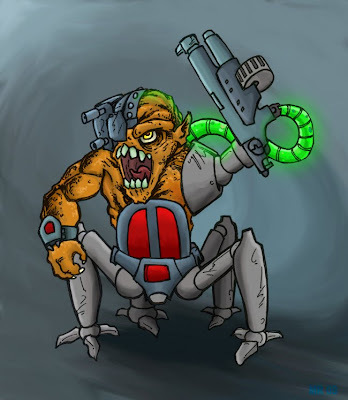 Mandukar is chief of security for a group of alien mercenaries known as the Paradroid Confederation. During a battle long ago his ship was destroyed, and Mandukar required extensive reconstructive surgery to survive. He took the opportunity to install several highly dangerous weapons systems into his new cyborg body, in addition to enhanced vision, all terrain walkers, adrenaline pumps, automatic pain killers, and an all purpose weapon arm that can be adapted to whatever ordnance is on hand. Mandukar servers now as security chief, but tends to get personally involved too often. Deranged, howling primates that infect forests worldwide. Lemurites are regarded as little more than disease carrying vermin to be exterminated by most. They move in tribes, and can be heard by their incessant continuous howls and braying. Lemurites are not truly dangerous unless encountered en mass, where they have been known to tear their victims apart. Paxlus the thinker is the chief mechanic for a group of alien cybernetic mercenaries known as the Paradroid Confederation. They hold no political alliances and have been known to switch sides depending on who pays more. Paxlus himself is valued for his exceptional engineering skills, and personally designed many of the group's cybernetic enhancements. 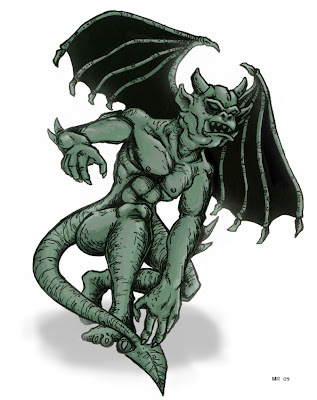 Gargoyles are misshapen, winged humanoids with rough, rock-like skin. 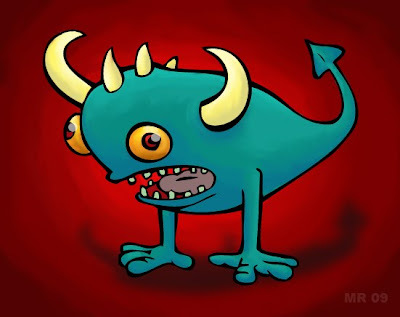 They generally have a outward demonic appearance. By day they are seen on the rooftops and ledges of buildings, cathedrals, and the like. 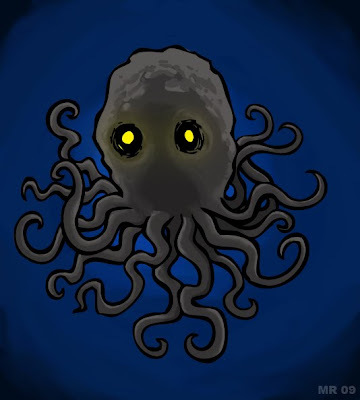 However it is the effect of direct sunlight that turns them into such "statues," thus by night they are free to roam. The stone-like properties of a Gargoyle's skin make them extremely durable.